ShalMartia zh'Bla or Martia as she is called by others was born in the settlement of Harbortown on Andor in 2355. Despite the reproduction crisis on Andor Martia was never interested in starting a family. As it turns out Martia was only interested in human women. While at Starfleet Academy she met a woman named Paula Cassidy that she became involved with. They were separated when Paula was assigned to the Hood and Martia the Lexington. 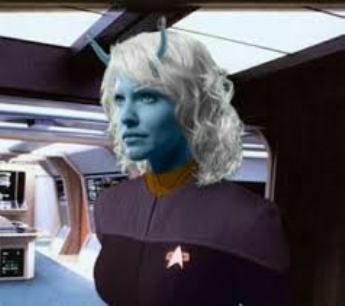 While on the Lexington Martia met Kel another Andorian who was not very forgiving of her ignoring the call to return home to start a family. While on the Lexington Martia met Martha Gross and the two started dating. Things did not get better since both Martia and Kel were transferred to the Odyssey. The friction between Kel and Martia got to the point that Commander Scott had to go to Captain Juhl. Captin Juhl offered them the opportunity to become bondmates which Martia declined. Juhl did warn both officers that he would separate them if necessary if they were unable to work together as professionals. A couple days later Martia proposed to her girlfriend Martha Gross only to have Gross say no due to Martha wanting to marry a man and start a family.